Union County has always been considerate of her worthy indigent poor. Among the earliest records is found evidence of the authorities providing relief for those needing aid. The Board of County Supervisors is the overseers of the poor of the county. It is also the duty of the trustees in several townships and councils in the town to provide for cases needing assistance. The county is divided into five districts, in each of which a physician is annual appointed by the board of Supervisors, for medical attendance upon those who are dependent upon the county. The several districts are named as follows: Creston district, Afton district, Lorimor district, Cromwell district and Shannon City district. At the October county election, in 1874, the question of purchase of a poor farm and tax levy for that purpose was submitted to vote of the county electors, and decided in the affirmative. At this time William Groesbeck, K. White and George A Ide constituted the Board of Supervisors and at their meeting Nov. 21, 1874, they contracted for the purchase of the one hundred sixty acres in Highland township known as the J.P. Emerson farm, described as north half of the south west quarter and south half of the north west quarter section 12 for the sum of 47 hundred dollars. The county has from time to time purchase land adjoining until the farm now comprises 247 acres. The farm is situated about six miles east of Creston and four miles northwest of Afton (on what is now Highway 34). When the farm was purchased some repairs were made and buildings were made to answer for the few inmates until 1879, when the board at the meeting in May passed the following resolution. Whereas the poor house of Union county having become unsafe and insufficient for the accommodations of the poor of the county, there, fore be it resolved by the board of supervisors that they proceed to erect a suitable building on the county poor farm for the use and benefit of the poor and also appropriate the sum of 5000 dollars to build the same. 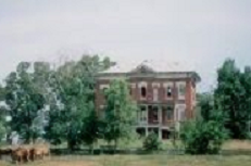 The building a three story brick 36 x 40 feet, containing 27 rooms, was erected in 1879 and has been kept in excellent repair. It is now equipped with a modern hot water heating plant and conveniences for the care and comfort of the inmates. Adjoining the brick is one and a half story, frame building 24 x 28 with addition. Suitable barns, cribs, and sheds are provided for the use of the farm and a wind mill and piping from an excellent will furnishes water in abundance. The buildings are situated nearly in the center of the farm and are protected on the north by a grove of native timber. The livestock belonging to the county is among the best and the farm is equipped with needed teams and implements for the successful running of the place. The steward of the poor farm is appointed annually by the board of supervisors and he is under their direction and control. His salary for the year 1908 is $750.